The New Jersey Pinelands is an ecologically diverse area in the southern New Jersey Coastal Plain, most of which overlies the Kirkwood-Cohansey aquifer system. The demand for groundwater from this aquifer system is increasing as local development increases. Because any increase in groundwater withdrawals has the potential to affect streamflows and wetland water levels, and ultimately threaten the ecological health and diversity of the Pinelands ecosystem, the U.S. Geological Survey, in cooperation with the New Jersey Pinelands Commission, began a multi-phase hydrologic investigation in 2004 to characterize the hydrologic system supporting the aquatic and wetland communities of the New Jersey Pinelands area (Pinelands). 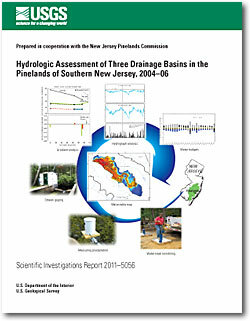 The current investigation of the hydrology of three representative drainage basins in the Pinelands (Albertson Brook, McDonalds Branch, and Morses Mill Stream basins) included a compilation of existing data; collection of water-level and streamflow data; mapping of the water-table altitude and depth to the water table; and analyses of water-level and streamflow variability, subsurface gradients and flow patterns, and water budgets. During 2004–06, a hydrologic database of existing and new data from wells and stream sites was compiled. Methods of data collection and analysis were defined, and data networks consisting of 471 wells and 106 surface-water sites were established. Hydrographs from 26 water-level-monitoring wells and four streamflow-gaging stations were analyzed to show the response of water levels and streamflow to precipitation and recharge with respect to the locations of these wells and streams within each basin. Water-level hydrographs show varying hydraulic gradients and flow potentials, and indicate that responses to recharge events vary with well depth and proximity to recharge and discharge areas. Results of the investigation provide a detailed characterization of hydrologic conditions, processes, and relations among the components of the hydrologic cycle in the Pinelands. In the Pinelands, recharge replenishes the aquifer system and contributes to groundwater flow, most of which moves to wetlands and surface water where natural discharge occurs. Some groundwater flow is intercepted by supply wells. Recharge rates generally are highest during the non-growing season and are inversely related to evapotranspiration. Analysis of subsurface hydraulic gradients, water-table fluctuations, and streamflow variability indicates a strong linkage between groundwater and wetlands, lakes and streams. Gradient analysis indicates that most wetlands are in groundwater discharge areas, but some wetlands are in groundwater recharge areas. The depth to the water table ranges from zero at surface-water features up to about 10 meters in topographically high areas. Depth to water fluctuates seasonally, and the magnitude of these fluctuations generally increases with distance from surface water. Variations in the permeability of the soils and sediments of the aquifer system strongly affect patterns of water movement through the subsurface and the interaction of groundwater with wetlands, lakes and streams. Mean annual streamflow during 2004–06 ranged from 83 to 106 percent of the long-term mean annual discharge, indicating that the data-collection period can be considered representative of average conditions. Measurements of groundwater levels, stream stage, and stream discharge and locations of start-of-flow are illustrated in basin-wide maps of water-table altitude, depth to the water table, and stream base flow during the period. Water-level data collected along 15 hydrologic transects that span the range of environments from uplands through wetlands to surface water were used to determine hydraulic gradients, potential flow directions, and areas of recharge and discharge. These data provide information about the localized interactions of groundwater with wetlands and surface water. Wetlands were categorized with respect to whether they lie in groundwater recharge or groundwater discharge areas. Recharge-area wetlands and nearby surface water are supported by local precipitation and groundwater that moves along short flow paths; therefore, they are sensitive to drought conditions. Discharge-area wetlands and surface water also receive local groundwater but also benefit from more persistent regional groundwater flow, which continues to support the wetlands and surface water during dry periods when the more localized, shallow groundwater flow is reduced or has ceased. Geologic characteristics of sediments overlying and within the unconfined aquifer can limit infiltration and recharge rates and affect the flow of groundwater that supports wetland water levels and streamflow. Low-permeability sediments, common in the Kirkwood-Cohansey aquifer system, were identified as the cause of localized mounding of the water table and, therefore, support local wetlands and streamflow. The extent and effectiveness of the low-permeability layers varied considerably in the areas studied; this variability may directly affect interactions among the groundwater, wetlands, and surface water. Water budgets, a means of hydrologic accounting in which system inflows are balanced by outflows and changes in storage, were developed to quantify major components of the hydrologic cycle in the three basins. Water-budget components were evaluated monthly to examine seasonal variations in, and relations among, them. Monthly recharge to the aquifer system, estimated as a residual, was as much as 20 centimeters during "wet" months when the sum of inflows (primarily precipitation) exceeded the sum of outflows plus the net change in storage. Recharge was occasionally negative (as small as -5 centimeters) during "dry" months when the sum of outflows (primarily evapotranspiration) exceeded the sum of inflows plus the net change in storage. The water-budget analysis shows that the hydrologic system supporting the Pinelands wetland and aquatic habitats is dynamic and is potentially sensitive to variations in components of the hydrologic budget. Walker, R.L., Nicholson, R.S., and Storck, D.A., 2011, Hydrologic assessment of three drainage basins in the Pinelands of southern New Jersey, 2004–06: U.S. Geological Survey Scientific Investigations Report 2011–5056, 145 p.